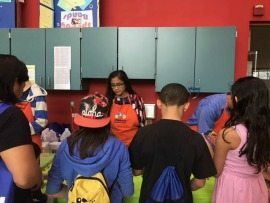 The first time Kirthi Kumar attended the K-12 STEM Symposium, she was in fifth grade and excited to present a science fair project. Over the next two years, she volunteered at the symposium through the Children’s Science Center. Now, a sophomore at Thomas Jefferson High School for Science and Technology, Kirthi is the founder of SheSoft, a nonprofit that aims to bridge the gender gap in technology by supporting young girls. Since first encountering computer programming through Scratch in third grade, Kirthi has programmed in multiple languages including JAVA, C++, Python, MATLAB and HTML/CSS. WashingtonExec facilitated the first symposium in 2013 to localize the national effort at filling the workforce pipeline gap in science, technology, engineering and math jobs. This year, Kirthi’s alma mater, Nysmith School for the Gifted, will host the event April 14. There is no admission fee, but organizers request attendees register in advance. Presented by Altamira Technologies, the symposium is expected to draw more than 4,000 attendees — parents and students as well as representatives from government, corporate, nonprofit and academic sectors. Organizers aim to inspire students to work toward developing STEM skills while strengthening the communitywide infrastructure needed to support them. Kirthi’s work, which includes developing an award-winning computer game and building an application that tracks sugar intake, has garnered attention from The Washington Post and Connection newspaper. She was recognized in 2017 and 2018 by the National Center for Women in Technology and in 2017 through the Siemens Competition. Kirthi said she was drawn to the STEM Symposium by the wide variety of activities offered. 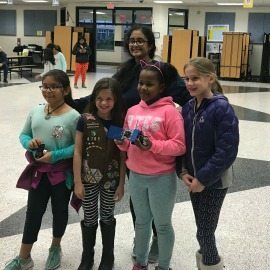 “I liked the STEM booths and live demonstration of drones, computer vision products, space science exhibitions, hands-on experience with robotics engineering, educational sessions and amazing and inspiring speakers and tech talks,” she said. Kirthi said she appreciates the opportunities the symposium provides as it allows students to present the work they have done. After graduation, she plans to pursue a degree in engineering and computer science. 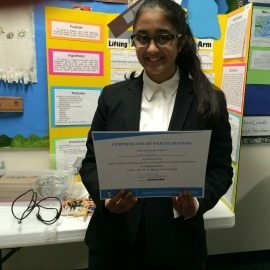 “As I pursue my passion for STEM, I would like to give back to my community by mentoring upper elementary and middle school girls through the SheSoft championship and conference at George Mason University on June 2, 2018, sparking their curiosity in science and computing through seminars, webinars and championships,” she said.